This article is about a geographic region of Bosnia. For other uses of the term Bosnia, see Bosnia (disambiguation). Bosnia encompasses part of country not highlighted in red. The historical records of the region are scarce until its first recorded standalone (domestic) ruler and viceroy of Bosnian state, Ban Borić, appointed by 1154. De Administrando Imperio describes a small župa of Bosona (Greek: χωρίον Βόσονα) that was located around the river Bosna in the modern-day fields of Sarajevo and of Visoko. The area is thought to have been previously inhabited by the Illyrian tribe of the Daesitiates. Under its first known foreign ruler, Stephen, Duke of Bosnia, in the 1080s, the region spanned the upper course of the rivers Bosna, the Vrbas and the Neretva. 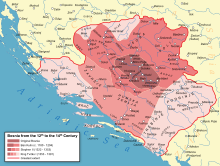 At the end of the 14th century, under Tvrtko I of Bosnia, the Bosnian kingdom included most of the territory of today's Bosnia and of what would later become known as Herzegovina. The kingdom lost its independence to the Ottoman Empire in 1463. The region of Bosnia's westernmost city at the time of the conquest was Jajce. The Ottoman Empire initially expanded into Bosnia and Herzegovina through a territory called the Bosansko Krajište. It was transformed into the Sanjak of Bosnia and the Sanjak of Herzegovina after 1462/1463. The first Ottoman administration called Eyalet of Bosnia was finally formed in 1527, after long armed resistance to the north and to the west by Counts Franjo and Ivaniš Berislavić of the noble house of Berislavići Grabarski. Eventually, following the Great Turkish War, in the 18th century the Eyalet came to encompass the area largely matching that of today's Bosnia and Herzegovina. In 1833, the Eyalet of Herzegovina was temporarily split off under Ali-paša Rizvanbegović. 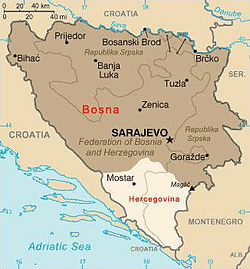 The area acquired the name of "Bosnia and Herzegovina" in 1853 as a result of a twist in political events following his death. After the 1864 administrative reform, the province was named Vilayet of Bosnia. Austria-Hungary occupied the whole country in 1878. It remained formally part of the Ottoman Empire under the title of Condominium of Bosnia and Herzegovina until 1908, when Austria-Hungary provoked the Bosnian crisis formally annexing it. Sarajevo - View from east. ^ Mrgić-Radojčić 2004, p. 52–53. Mrgić-Radojčić, Jelena (2004). "Rethinking the Territorial Development of the Medieval Bosnian State". Исторјски часопис. 51: 43–64. Živković, Tibor (2010). "On the Beginnings of Bosnia in the Middle Ages". Spomenica akademika Marka Šunjića (1927-1998). Sarajevo: Filozofski fakultet. pp. 161–180.